This is the second part of a four-part guide, derived from a syllabus of a class that I teach at EVE University. I wrote the original version of this syllabus in March 2010, and it has since been improved and updated by my fellow teachers and professors at E-UNI – my heartfelt thanks to all of them. You can find the first part of this guide here. Pilots who intend to specialize in the use of drones will need to train more than a few supporting skills. Drone Interfacing - the best support skill, increases drone damage by 10% per level. Also, it improves mining drones' yield by 10% per level, too! Drone Durability - makes your drones tougher and harder to kill. Useful if you find your drones dying quite a lot, especially in mission-running. Drone Navigation - makes your drones faster when they are using their microwarpdrive. It doesn't affect non-MWD speed, so it doesn't affect how much damage your drones do. Useful to get your drones to their targets faster, especially the slow-moving heavy attack drones. Drone Sharpshooting - increases the optimal range (by 5% per level) at which your drones can shoot effectively. Required for effective use of sentry drones, and also useful for helping your drones to get into range faster. Drone Avionics - it unlocks one of the drone support modules (the Drone Link Augmentor), and gives you an extra 5 km of drone control range per level. Advanced Drone Avionics - it unlocks the use of EWAR drones, but more importantly, it also gives you a longer drone control range (+3 km per level) for all drones, not just EWAR drones. <Racial> Drone Specialization - as well as unlocking the relevant Tech II drones, it also increases the damage done by those Tech II drones. Drone Damage Amplifier - a low-slot module, it simply increases the damage your drones deal. Fitting more than one will suffer from stacking penalties, just like other low-slot damage modules. Very effective in specialized drone ships. Drone Link Augmentor - a high slot module, increases your drone control range by 20 kilometers per Tech I module (or 24km per Tech II module, or 26km per module if using the Black Eagle faction variant), without stacking. However, the further you send your drones, the longer they will take to get there. Very helpful for sniping with long-range sentry drones. Drone Navigation Computer - a mid-slot module that increases the thrust of your drones' microwarpdrive. Because it increases thrust instead of directly increasing speed, it is more effective in lighter drones. You will gain a much bigger effect from this module for light scout drones than you will for heavy attack drones. Omnidirectional Tracking Link - a mid-slot module that increases your drones' tracking speed and optimal range. Great for sentry drones, but less used for other drones, although it can still add some damage, especially if you use your drones against smaller ships (e.g. medium scout drones versus frigates). "Omnis" can use loaded scripts to maximize the bonus either for tracking speed or for optimal range, or you can use it unscripted for a moderate bonus to both. Drone Control Unit - a module that can only be fitted to capital ships that gives you the ability to launch one extra drone (more importantly, one extra fighter or fighter-bomber) in space. Drone Control Range Augmentor - increases a ship's drone control range by 15 km (Tech I version) or 20 km (Tech II version). Drone Durability Enhancer - increases a ship's drone shield, armor and structure hit points. Drone Mining Augmentor - improves mining drones' ore mining yield by 10% (Tech I version) or 15% (Tech II version). Drone Repair Augmentor - improves the repair amounts of shield or armor repair drones by 10% (Tech I version) or 15% (Tech II version). Drone Scope Chip - increases a ship's drone optimal range by 15% (Tech I version) or 20% (Tech II version) - helpful for ships using sniping sentry drones. Sentry Damage Augmentor - another excellent rig for ships specializing in sentry drones - increases sentry drone damage by 10% (Tech I version) or 15% (Tech II version). Stasis Drone Augmentor - increases a ship's stasis drones' velocity reduction of targeted ships by an additional 15% (Tech I version) or 20% (Tech II version). For an example of a ship using drone rigs to enhance sentry drone performance, see this Rattlesnake PvE mission boat. You can only issue engage, mine, guard and assist orders to drones that are within your drone control range, and you can only order them to attack/mine/assist things that are within this range. The standard drone control range is 20,000m (20km). The Drone Avionics skill will increase this by 5km per level, and the Advanced Drone Avionics skill will increase it by 3km per level. Training both these skills to V will give you a drone control range of 60km, which can be further enhanced with various modules and rigs. Your drone control range is always the distance from your ship to your drones (even if you assign your drones to someone else). If your drones are further away than this, you cannot order them to engage, mine, assist or guard anything, and if the target is further away than this you cannot order your drones to engage, mine, assist or guard that target. Drone control range is only the range at which you can give orders, but remember that drones can be set to operate semi-autonomously. If for some reason your drones do get further away than your drone control range, they will happily continue doing what they are doing autonomously. For example, if you set your drones to attack a target that subsequently moves away, your drones will continue attacking that target even if it moves out of your drone control range. You can order drones to return (either to orbit, or to drone bay) so long as they are within 250km of you. Once your drone(s) are further away than this 250km, you can't even do that - and if their target is destroyed or warps off then they will become abandoned, and you will have to go and get them. Watch out when setting drones to attack fast-moving targets such as interceptors. They move at extremely high speeds, so your drones will often need to stop shooting and activate their microwarpdrives to catch up with them. However, drones generally do not activate their MWDs when they are outside your drone control range. If their target is too far away, they will instead become Idle and start making their way slowly back to you, without using their microwarpdrives. With intensive drone skill training, and by fitting drone modules and rigs, you could theoretically extend your drone control range to over 150km. Pilots using sentry drones as long-range snipers need a large drone control range, because sentries will not fire on anything outside of that range, even if your ship can lock on targets at that distance. Using mobile combat drones as extended-range weapons is not very effective, as it takes a lot of time for even the fastest drones to travel long distances. For example, it would take half a minute for the speediest drones, Tech II Warriors, to reach the target at 150km. Most drone boat pilots try to establish an effective drone control range of about 50-70km. Most drone engagements for pilots with typical drone skill levels occur between 15-30km. Most new players use drones in a rather ham-fisted fashion. They fly into a mission room, deploy drones, target enemies, order drones to engage, and see what happens. This can be effective in simpler missions - but can also be a disaster in more complex situations. Understanding how to engage and control your drones effectively will maximize your chances of success - or survival. To see your drone control window, you must be undocked in a ship that contains drones. Your drone control window should be placed on your screen where it is easily accessible, especially if you are a drone boat pilot. Many pilots put this in the lower right corner, but you can place it anywhere as long as it won't be cluttered behind your overview or other windows. To launch your drones, right-click on the desired drones within the 'Drones in Bay' section of the drone window, and select 'Launch Drones'. To make launching multiple drones faster, you can add drones to groups (to do this, right-click on a drone in the drone bay and select Move Drones). You can also launch drones by selecting selected lines (including a group) from your Drone Control Window, dragging them to open space on your display, and releasing the mouse button. Note that you cannot launch more drones than your ship bandwidth allows. To know your ship's bandwidth, right-click on your ship in space, click the "Show Info" option and select the "attributes" tab. If you try to launch more drones than permitted (for example, if you add six drones to a group and then try to launch the group) you will still launch all the drones you can, and then also get an error message saying you can't launch that many in space. Unfortunately, the 'Launch Drones' command cannot be keybound. In the upper left corner of your drone control window, you will see a square consisting of horizontal parallel lines. Left-click on this square, and you will see the "Drone Settings" option. You will see options for Passive vs. Aggressive, for Focus Fire, and an option for Fighter Settings: Attack and Follow. Changing the options in this window will set the default behavior for your drones. The Passive option will keep your drones under your direct control - with this option selected, your drones won't automatically attack when you are being aggressed by another entity. They will continue to orbit and remain idle until directed otherwise by you. Under the recently revised Crimewatch system, any pilot that does the last two actions in high security space gets a SUSPECT flag, and becomes a valid target for anyone. Be aware that if you then attack them, then you become a valid target for the aggressor, and they can fight back without having to worry about CONCORD (if in high security space). Having drones launched and set to aggressive is very useful if you are engaging opponents who have jamming (ECM) or sensor dampening capability. You won't be able to direct them between targets if you are jammed or damped out of targeting range, but if you have your drones set to aggressive, they will automatically attack the jamming or damping ship anyway (assuming it is within your drone control range). The "Focus Fire" option, when selected, will direct your drones to concentrate all their fire on one target until it is destroyed, or until you direct them to engage a different target, instead of spreading their fire on multiple targets. It's usually a good idea to have this selected. The "Attack and Follow" option pertains only to fighters, launched from carriers. Basically, it means that fighters will pursue a designated target until it is destroyed, even if it warps away. With this option selected, the only ways for a target to evade your fighters are to either destroy the fighters, jump out of system, or dock at a station. When you launch your drones, you'll see on your overview that they are now considered 'Drones in Local Space'. If you expand that menu you can monitor your drones' health. You'll see three bars for each drone for shields, armor and structure - when the structure bar turns all red, your drone is destroyed. It's a good idea to recall your drones that are in danger of being blown up, especially if they are Tech II drones, which are expensive. To command a drone, select it from the drone window and right-click to open the command menu. If you want to command multiple drones at the same time, right-click the group of drones, or the 'Drones in Local Space' bar to order all drones simultaneously. Attack: This will tell the drone to attack the current selected target until it's destroyed or it warps off. If your drones are set to 'Aggressive', once the target is destroyed or warps off your drones will then pick another valid target (if there is one) and immediately attack that target. If there is no other valid target, they will return and orbit your ship. If they are outside your drone control range when the target is destroyed or warps off, they will just stop in space. Assist: Your drone will be assigned to one of your fleet members, and then they will engage automatically any object that the fleet member attacks. The fleet member can't control your assigned drones directly - the assigned drones will simply attack the last thing the fleet member activated a hostile module on. Be aware that if the fleet member to whom you assign your drones commits an aggression in high-security space, triggering CONCORD to intervene, your ship will be targeted and destroyed as well, as the drone owner responsible for their behavior. The assigned drones are still yours, so they are still affected by your skills and bonuses, and are still constrained by the drone control range between your ship and your assigned drones. Guard: Your drone will protect a target fleet member, thus the drone will automatically retaliate on any threat attacking against that ship. Note that the target fleet member in question has no control over the drone. Again, the drones are still yours and are affected by your skills and your drone control range. This is similar to the 'Aggressive' setting, except the drones respond to attackers on the guarded ship instead of yours. Mine: Your drones that are capable of mining will mine the target for one cycle then return and orbit your ship. Mine repeatedly: Your drone capable of mining will mine the target over and over until it is depleted. Return to drone bay: Your drones stop what they are doing and travel with maximum speed towards your ship's drone bay and re-dock there. Return and orbit: This command tells your drones to stop doing what they are doing and return to your ship, where they will orbit. The Attack, Return to Drone Bay, and Return and Orbit commands can be key-bound. Abandon: Drones can sometimes become stuck and unable to return to their controller's drone bay. In such cases, abandoning them to be able to launch a new wave could be a wise decision, or so that you can scoop them up later. This will abandon the drone and it will stop in space and become inert (more on this in a minute). Scoop to Cargo: With this command, you will scoop the drone to your cargo hold, if it is within 2,500 meters of your ship. Be careful, though, as you will not be able to launch the drone from there. Use this if your drone bay is full or if you want to salvage an abandoned drone. Scoop to drone bay: Choose this command when you want any disabled drones to be re-docked in your drone bay so that you can re-launch them. Again, this only works if the drone is within 2,500 meters of your ship. Note that you may not see all of these options on the menu, depending on the type of drone you've selected and whether you have another object targeted. If a drone-controlling ship warps out of an area without retrieving its drones either to its drone bay or cargo hold, the drones left behind will become inert and abandoned. This also happens if the drones are more than 250km from their owner when their current command comes to an end - they will just stop and become inert. If the owner returns to the same grid (or approaches the out-of-range drones) they can right-click their ship capacitor and select 'Reconnect to Lost Drones' to regain control over them. Any abandoned drone is free loot to any pilot that cares to collect them. You will not be combat flagged for taking abandoned drones. This is the end of Part II of this Drones Guide. Part III can be found here. Posted in Guide and tagged with Drones, EVE Online. June 30, 2013 by Neville Smit. The following guide is derived from a syllabus of a class that I teach at EVE University. I wrote the original version of this syllabus in March 2010, and it has since been improved and updated by my fellow teachers and professors at E-UNI – my heartfelt thanks to all of them. This is the first section of a four-part guide. There are a myriad of weapon systems available to capsuleers in EVE Online, but the most misunderstood and misused is drones. This guide provides a general introduction to drones, and their effective use. Drones are robotic vehicles launched from spacecraft, designed to augment the launching ship's capabilities. Drones are stored in and launched from the drone bay of a ship, and require bandwidth from the ship to control. Drones are most often used as damage-dealing combat weapons, but they can also be used for other functions: mining, salvaging, ship repair, and electronic warfare. Drones can be instructed to commit to specific targets, but they are also able to take action on their own. For example, combat drones that destroy a target ship can be set to move autonomously onto a new target. This provides the pilot with the option to let his or her drones "do their thing" while concentrating on other tasks. However, drones are not very smart, and if left on their own, they can do some very dumb things. A good pilot knows when and how to exert control over his or her drones. Bandwidth: A ship attribute which affects the number and types of active drones you are capable of launching in space at a given time. Think of bandwidth as radio strength of your ship dedicated to controlling your drones in space. Drone bay size: Another ship attribute that dictates the number of drones you can carry. Note that drones can not be deployed from the cargo hold, although they can be stored there like any other item. You cannot transfer drones between your cargo bay and drone bay while in space. If you want to launch drones, you need to put them in the drone bay when docked (or when near to a ship or POS module with fitting services). Drones are capable of serving many different roles, and they come in a mix of four racial flavors, three sizes and two tech levels - with a couple of hybrid variants. By far, combat drones are the most used by pilots. The damage they inflict are determined by their race of origin, their size, and tech level. The three sizes of combat drones are roughly equivalent to small, medium and large sizes of turrets, with similar statistics for tracking speed and damage. Tech I combat drones are the most plentiful, cheap and easy-to-use drones in the game. Tech II drones, produced by players through the invention process, are more expensive to manufacture than Tech I drones, and have the highest skill requirements. As a result, Tech II combat drones gain a 20% advantage in hitpoints, speed, tracking and damage compared to the basic Tech I versions. They can also gain an extra 2% damage for each level of their racial Drone Specialization skill that is trained, for a potential of 30% more damage than Tech I drones with maximum skills. Faction Navy drones are advanced combat drones that are only available from each Empire’s Factional Warfare loyalty point stores. They are notable for their excellent hitpoints and tracking, as well as low skill requirements (same as Tech I drones). Their speed and damage are similar to Tech Two drones, but the Navy Drones do not gain the extra 2% bonus per level from any racial Drone Specialization skills. “Integrated” and “Augmented” combat drones are both built from components and blueprints looted from the remains of deadly rogue drones in the drone regions of nullsec space. "Integrated" drones have low skill requirements (same as Tech I drones), deliver 15% more damage, and have 10% more hitpoints, tracking and speed than Tech I drones. “Augmented” drones also have similar bonuses to hitpoints, tracking and speed, but also have a damage bonus of 32% above Tech I drones, putting their damage on par with a fully-skilled Tech Two drone. In addition, "Augmented" drones deliver a mix of two damage types, instead of just one. With the right skills, any pilot can deploy any kind of combat drone, no matter what faction type that they or their ship may be. And because each race's drones deal out a specific damage type, this gives pilots flexibility in matching the optimum combat drones against the weaknesses of expected targets. Light scouts are the smallest and fastest combat drones, taking up only 5m³ drone bay space, and requiring 5Mbit/sec bandwidth each. With their high tracking speeds and velocity, they are the drones of choice versus frigates, destroyers and other drones. When they engage with a target, they operate at very close ranges. Tech II light scout drones are about 20% faster and more powerful than Tech I varieties, before any additional skill-related enhancements. Warrior IIs, for example, are fast enough to catch all but the fastest of interceptors. If you are going to be a drone boat pilot, you need to make Tech II drones a priority in your skill development plan. Hobgoblins and Warriors are the most commonly seen light scout drones in space - Hobgoblins for doing the most damage, whilst Warriors are the fastest and can keep up with the speediest of targets. However, in some situations, damage type can outweigh other considerations, especially when you know the resistance profile of your targets in advance (e.g., missions). Medium scouts are the next step up from light scout drones. They take up 10m³ drone bay space, and require 10Mbit/sec bandwidth each. These do more damage-per-second (DPS), but with slower tracking speeds, making them the best drones to use against mid-sized targets like cruisers and battlecruisers. The Gallente medium scout drone - Hammerheads - have again the highest damage output, and the Minmatar verison - the Valkyrie - is again the fastest. Most people prefer Hammerheads in PvP for their higher DPS. The largest standard combat drones, Heavy Attack drones take up 25m3 drone bay space, and require 25Mbit/sec bandwidth each. Their high DPS but low tracking speeds make them ideal for use against large, slower targets like battleships and stationary targets. Because of their slow tracking speeds, heavy drones will do less damage to small fast-moving targets such as frigates. They also take quite a while to reach targets at longer distances. However, against larger, nearer targets, they are superb weapons. Gallente combat drones deal out the highest damage, but have the slowest velocities and tracking speeds. Minmatar drones have the highest velocities and tracking speeds, but deliver the lowest damage. Caldari drones do more damage than all the other races except Gallente, but are also slower than all the other races except Gallente. Amarr drones do moderate amounts of damage, but are outmatched in velocity and tracking speed only by the Minmatar. And, of course, each race's drones specialize in one type of damage. The key point is to know your potential enemy's weaknesses, and then load the drones that emphasize strengths against those enemy vulnerabilities. Use EVE-Survial.org before doing a mission, which will tell you what kind of damage to deal out, and thus, what kind of drones are best to bring along. For many years, Amarr drones had a "bad rep". This is undeserved - Amarr drones are very helpful against targets that are vulnerable to EM damage, such as Blood Raiders and Sansha Nation. They are also now some of the fastest drones, outmatched in velocity only by the Minmatar. Many people consider Gallente drones, due to their higher DPS, to be the "general purpose" or "default" drone to use. Certainly, Gallente drones deal out relatively high thermal damage, but remember that they are also the slowest drones. If they can't keep up with fast targets, their value will be reduced. And if a target has high thermal resists, your Gallente drones won't do much damage at all. In short, don't make broad assumptions about which drone types to use. Do your homework, and select the best mix for the expected combat situation. These are the same size as heavy drones (25m³), and require the same amount of bandwidth (25Mbit/sec). However, instead of orbiting the target ship, they stay where they have been deployed and fire at their enemies from long range. They are, in effect, robotic snipers. They have varying ranges and falloffs that are much longer than their heavy attack cousins. However, they have low tracking speeds and are immobile once deployed. As the table shows, the optimal and falloff ranges of the different racial types of sentry drones vary significantly. The Gallente sentry drone (Garde) does the highest damage and tracking, but has the shortest range. The Caldari sentry drone (Warden) has the longest range but lower damage and tracking. Amarr (Curator) and Minmatar (Bouncer) sentries operate at moderate range and damage, relatively. Harvester mining drones yield an extra five cubic meters per cycle over its Tech II cousin, at the expense of going half as fast. However, they are now very rare, and extremely expensive. The only source that existed for the Harvester drone was from killing NPC convoys in an early release of EVE. One of the random drops from these killed freighters would be these drones. However, CCP stopped Harvester drones from being dropped from NPC convoys. Experienced miners know that Harvester mining drones, while able to mine a slightly larger volume, are not worth their exorbitant cost, since they fly at much slower speeds. Tech II mining drones are about one-third more productive than the Tech I variety, because they collect more ore per trip (25 m³ instead of 15 m³) and they fly at higher speeds (100 m/sec faster). Small: 5 m³ in size, 5 MB/second bandwidth use. Cycle time is 10 seconds; same as for ship-fitted salvaging modules. Also, there is no difference in the quality of the salvage received. Salvage drones can salvage the same items as the salvage modules, the only difference being that because of lower chance they are much worse at salvaging difficult wrecks (and are incapable of salvaging the most difficult Sleeper wrecks). See this salvage guide for more information on salvaging probabilities. Electronic Warfare Drones - which provide extended tracking disruption, jamming, sensor dampening and target painting capabilities. ECM drones are by far the most commonly used, and are great in solo or small gang PvP. Combat Utility Drones - which enable pilots to apply energy neutralizing and stasis webifying effects at range. These are less effective than their ship module versions, but being drones means you can project them at long ranges. 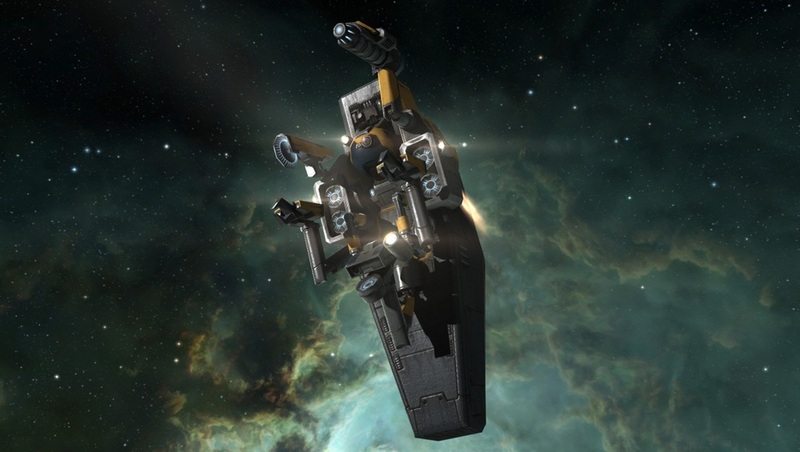 Logistics Drones - which provide remote shield and armor repair capabilities to fleetmates. You can't use them to repair your own ship, because you cannot target yourself. Fighters and Fighter Bombers - powerful attack ships launched from carrier and supercarrier capital ships. They have warp drives and can chase people down that warp off. Carriers and Supercarriers can also field a lot more than just five of them. Fighters and fighter-bombers have almost the same size/damage as frigates. Although they operate like drones, fighters and fighter-bombers shouldn't really be called drones, because lore-wise they are piloted by humans. You can see this if you preview these models. We'll cover these advanced drones in more detail in Part IV of this guide. There are also 'drones' that can be encountered in missions or in wormhole space that will oppose pilots in combat: Rogue Drones and Sleepers. In this context, these 'drones' don't fall into the drone category on your overview in space, and are only really referred to as 'drones' in an lore or role-playing sense, which is to say that they are AI-controlled. In various missions, you will encounter "rogue drones". These come from self-aware hive-minds, made up of individual stray drones, all operating without a controller. These drones are always hostile. Practically speaking, pilots should consider rogue drones to be roughly equivalent to fast frigates. Sleeper drones are usually found in wormholes, also known as W-space. The Sleepers were an extinct human race which lived thousands of years before the playable EVE races. They were far more technologically advanced than the current human races, and their drones, which still guard their former bases and systems, can overcome any unprepared explorer easily. Recently, sleepers have begun to appear in known space, also known as k-space, in some combat site anomalies. This is the end of Part I of this Drones Guide. Part II can be found here. June 29, 2013 by Neville Smit.